Fender Jaguar Model Solid Body Electric Guitar (1964), made in Fullerton, California, serial # L-32632, sunburst lacquer finish, alder body, maple neck with rosewood fingerboard, original brown tolex hard shell case. This is a very nice example of a pre-CBS era Jaguar, showing only some light surface wear and in fine playing condition. The guitar has parts built over a longer spread than many similar Jaguars but still well within pre-CBS spec; the stamped neck date is Dec 62 but the pots date to the 8th week of 1964. This loose chronology among stockpiled parts is sometimes typical of this period although it is possible that the neck and body on this instrument were mated later. The factory Fender shims in the neck pocket are still in place so that seems unlikely but at this late date impossible to disprove. At any rate the guitar shows a bevy of the classic 1963-4 Pre-CBS features including the unbound rosewood fingerboard with the old style "clay" dot inlay, nicely blended 3-color sunburst lacquer finish on the body, and gold transition logo headstock decal. The pickguard is the older nitrocellulose tortoiseshell style, soon phased out at Fender in favor of a thinner (and less flammable!) ABS plastic. The guitar still lives in its original Brown Tolex hardshell case. Even having recently undergone a revival, the Jaguar remains a somewhat under-appreciated guitar with several interesting features. The scale length is shorter than other professional-grade Fender guitars at 24", a feature designed to enhance playability. 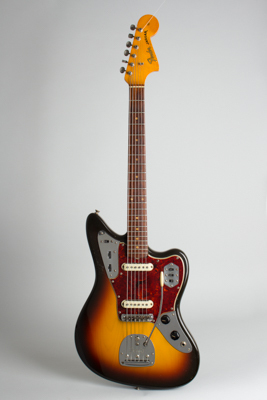 The "offset" body style, two-circuit wiring and floating vibrato are shared with the Jaguar's ancestor, the Jazzmaster, but the guitar actually feels quite different. The unique Jaguar pickups with the chrome-plated "claw" baseplate are optimized for clarity and crispness, factors that led to the model losing popularity in the late '60s as twang went out and distortion and crunch came in! Nevertheless, these are top-of-the line 1960s Fenders and very high quality guitars, still a relative bargain in a vintage Fender instrument. We've been setting these up recently in period 1964 style with flatwound 12s and folks are loving it! The Twang of the ages lives on. Overall length is 40 in. (101.6 cm. ), 14 in. (35.6 cm.) wide at lower bout, and 1 5/8 in. (4.1 cm.) in depth, measured at side of rim. Scale length is 14 in. (356 mm.). Width of nut is 1 5/8 in. (41 mm.). This guitar remains very clean overall with some finish dings and scrapes, and has all original finish and hardware. The most notable finish wear is to the back of the neck- which is down to the wood on both sides- and a spot of pick scraping above the upper chrome panel. There is no belt buckle wear at all and the rims are far less dinged up than most-someone played this guitar but took care of it. The original flip-up mute lever and chrome bridge cover are missing; all else is intact and complete. The frets have been taken down somewhat and there is some fingerboard wear in the lower positions but playability is still fine. A great feeling and playing Jaguar from the very moment the surf era had peaked and Beatlemania was taking over. Excellent Condition.